Researchers at Johns Hopkins have spotted a strong family trait in two distant relatives: The channels that permit entry of sodium and calcium ions into cells turn out to share similar means for regulating ion intake, they say. Both types of channels are critical to life. Having the right concentrations of sodium and calcium ions in cells enables healthy brain communication, heart contraction and many other processes. The new evidence is likely to aid development of drugs for channel-linked diseases ranging from epilepsy to heart ailments to muscle weakness. "This discovery was long in coming," says David Yue, M.D., Ph.D., a professor in the Johns Hopkins University School of Medicine's Department of Biomedical Engineering. 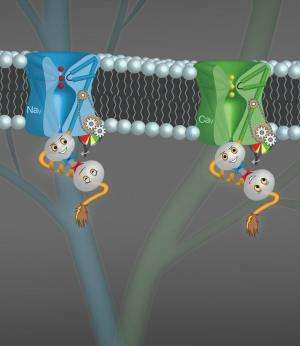 His team's report, which appears in the June 19 issue of the journal Cell, had its genesis in the 1990s with another group's observation that sodium and calcium channels bear a striking resemblance in a small portion of an otherwise very different structure. "It looked like this 'resemblance element' might be a molecular time capsule derived from a primeval ion channel thought to have birthed distinct sodium and calcium channels a billion years ago," Yue says. For calcium channels, Yue's and other research groups found that the resemblance element supports an important function, preventing the channel from opening when the cellular calcium level gets high. This prevents too much calcium from building up within cells, much like a thermostat controls household temperatures. This calcium control requires a calcium-sensing molecule called calmodulin, which binds to channels within the resemblance element. The picture for sodium channels, however, was muddier, with different researchers reporting conflicting findings about whether calmodulin and the resemblance element prevent the opening of sodium channels; perhaps the time capsule was damaged over the millenia or was never there. Manu Ben-Johny, a graduate student in Yue's laboratory, took up the question. "We thought that the conflicting results for sodium channels might be related to difficulties in existing methods to control the calcium concentrations that might affect these channels," Ben-Johny says. Looking for a new way to approach the problem, Yue's team bound calcium ions in molecular "cages" that could be opened with a flash of light. This enabled them to "smuggle" calcium ions into cells and see what happened to sodium channels when the calcium concentration changed abruptly. They found that, as with calcium channels, increasing calcium concentrations caused calmodulin to bind within the resemblance element of sodium channels and prevent their opening, just as in calcium channels. The implications of a common control element in sodium and calcium channels are vast, Yue says, including unified understanding of conditions that spring from defects in the calcium control of these channels. In addition, he says, "Researchers have long sought drugs that modulate sodium and calcium channels in new ways. Targeting the common control element offers a new frontier for developing next-generation pharmaceuticals."